Engineers solve problems, and work on emerging challenges in a wide range of areas important to improving quality of life; areas like sustainable energy, access to clean water, and improved communications and health care technologies. Kosky et. al. 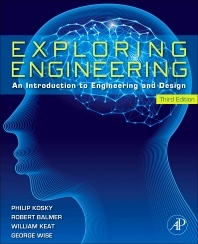 explore the world of engineering by introducing the reader to what engineers do, the fundamental principles that form the basis of their work, and how they apply that knowledge within a structured design process. The three part organization of the text reinforces these areas, making this an ideal introduction for anyone interested in exploring the various fields of engineering and learning how engineers work to solve problems. 6.7 Chemical Engineering: How Do You Make Chemical Fuels? 7.2 What do civil engineers do? 8.10 How does a computer work? 13.7 Is nuclear power a viable renewable energy source? 14.2 What do bioengineers do?